Apoptosis is a process of programmed cell death occurring in multicellular organisms in whom development, maintenance and sculpturing organs and tissues. Taken together, apoptotic processes are of widespread biological significance; being involved in e.g. development, differentiation, proliferation/homoeostasis, regulation and function of the immune system and in the removal of defected harmful cells. Dys regulation of apoptosis can play a primary or secondary role leading to cancer whereas excessive apoptosis contributes to neuro degeneration, autoimmunity, AIDS, and ischemia. Gaining insight into the techniques for detecting apoptotic cells will allow the development of more effective, higher specific and therefore better-tolerable therapeutic approaches. The goal of this review article is to provide a general overview of current knowledge, on the various technical approaches for detecting apoptotic cells. Development of all multicellular organisms depends on cell division, differentiation, maturation and cell death and an exquisite balance of these keeps the cell viable. , However, death is integral part of life. The term programmed cell death was introduced in 1964, which stated that cell death during development is not accidental in nature but follows a sequence of controlled steps leading to self-destruction. Apoptosis is one of the main types of programmed cell death in multicellular organisms. Tremendous progress has been made regarding understanding; up regulation of apoptosis could help fight autoimmune disease and cancer, its inhibition could help control events ranging from aging to ischemic heart disease to brain disease. Various means of detecting apoptotic cells have been explored and made available over the time. Historical Review: Over the years apoptosis has been discovered and rediscovered several times. The German scientist Carl Vogt was first to describe the principle of apoptosis in 1842. Wyllie described the first and the most dramatic DNA fragmentation in 1980. It is fairly a reliable and inexpensive method for detection of apoptotic cells. 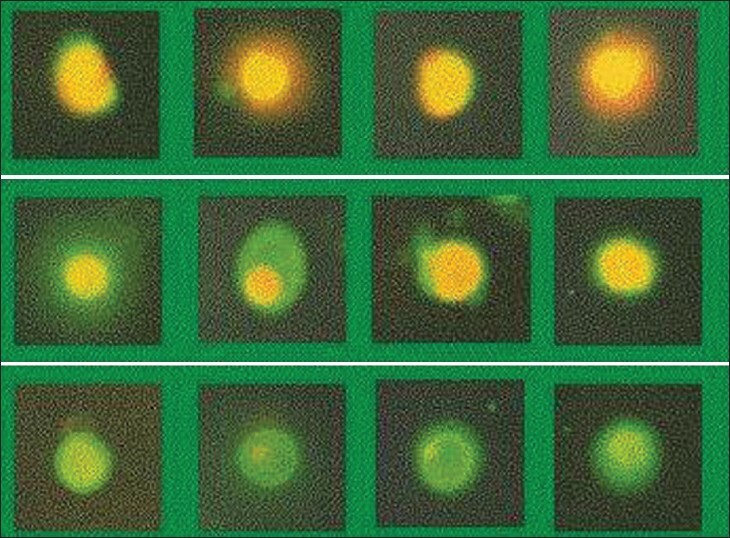 At low magnification fewer apoptotic cells are detected and there is an increase in inter observer variability; therefore a high-power lens should be used. Lowest numbers of apoptotic cells are usually scored in light microscopy based solely on morphology hence, revealing only tip of the iceberg. Defines the subcellular changes better. It shows most conspicuous changes like chromatin condensation phase and electron-dense nuclear material aggregating peripherally under the nuclear membrane; , there can also be uniformly dense nuclei. Extensive plasma membrane blabbing blebbing occurs followed by karyorrhexis and separation of cell fragments into apoptotic bodies by "budding." Apoptotic bodies consist of cytoplasm with tightly packed organelles with or without a nuclear fragment [Figure 2]. The organelle integrity is still maintained and all of this is enclosed within an intact plasma membrane. Apoptosis can be studied either under scanning electron microscope SEM or transmission electron microscope TEM. TEM analysis is essentially qualitative whereas, SEM studies can provide information of the cell surface, cell-cell and cell-substrates interactions but it is very difficult to evaluate apoptotic features by SEM. The plethora of information provided is wide, may be useful for subsequent biochemical or molecular studies furnishing important controls for experimental. TEM is preferred for analyzing tissues. Because only a small area can be visualized, quantification of the extent of apoptosis is also difficult. 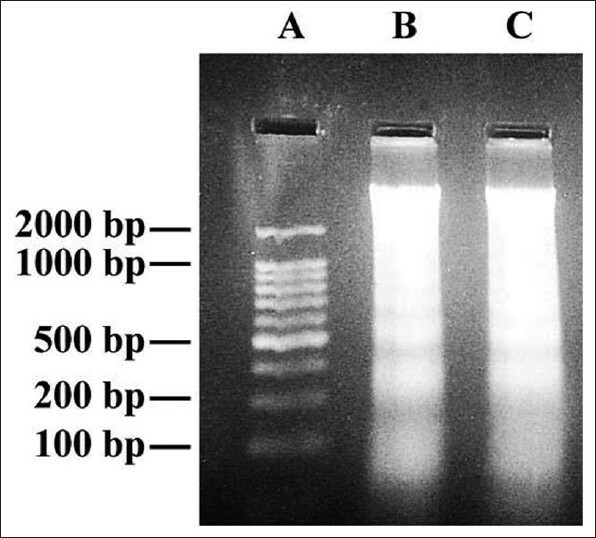 Conventional gel electrophoresis : is used to separate low molecular weight DNA appears as characteristic "ladder" pattern of discontinuous DNA fragments, which is a hallmark of apoptosis. Such a pattern of DNA degradation generally serves as a marker of the apoptotic mode of cell death. Pulse field gel electrophoresis is a specialized technique for resolving DNA molecules in the range of kilo to mega bases i.e., 50kb with length up to 10 Mbp. By alternating the electric field between the pair of electrodes, HMW DNA and chromosome size DNA from 200 to over 12000 kb can be separated because they are able to reorient and move differentially through the pores of an agarose gel. Single cell gel electrophoresis (SCGE) : visualizes DNA damage measured at the level of individual cells. It is a more sophisticated and precise method of cell death measurement at the single cell level compared with classical cell morphology assays. It is known as comet assay as the degraded DNA resembles comet shaped image on the electrophoregrams ([Figure 4]). The comet produced can characterizes the amount of DNA in the nucleus or "head" and the amount and pattern of DNA that has migrated away from the nucleus forming the tail embedded in the thin-layer agarose gels during the electrophoretic separation. It can detect various forms of DNA strand breakage dependent on the pH of electrophoresis. Under alkaline conditions (pH >13) it detects single-strand breakage, double-strand breakage, excision repair site, and alkaline-labile sites. , Under neutral conditions, it mainly detects double-strand DNA breakage and is therefore considered to be suitable for detection of apoptosis. ,, It's useful in assessing viability of cell: dead or living and cell death type: apoptosis or necrosis. 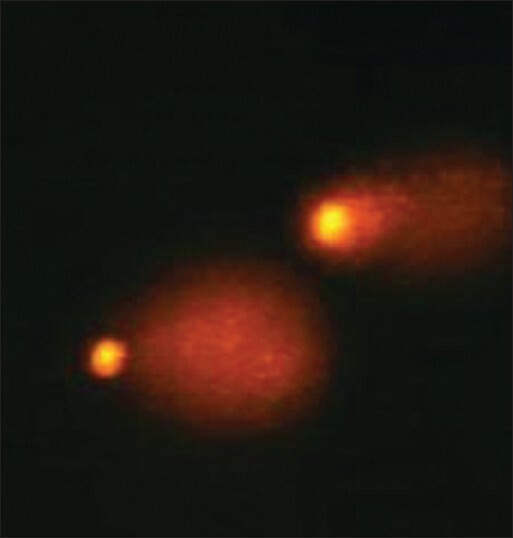 Apoptotic cell appear comet-like structures with large tails and small heads. Viable cell display a large head with only minute tail. 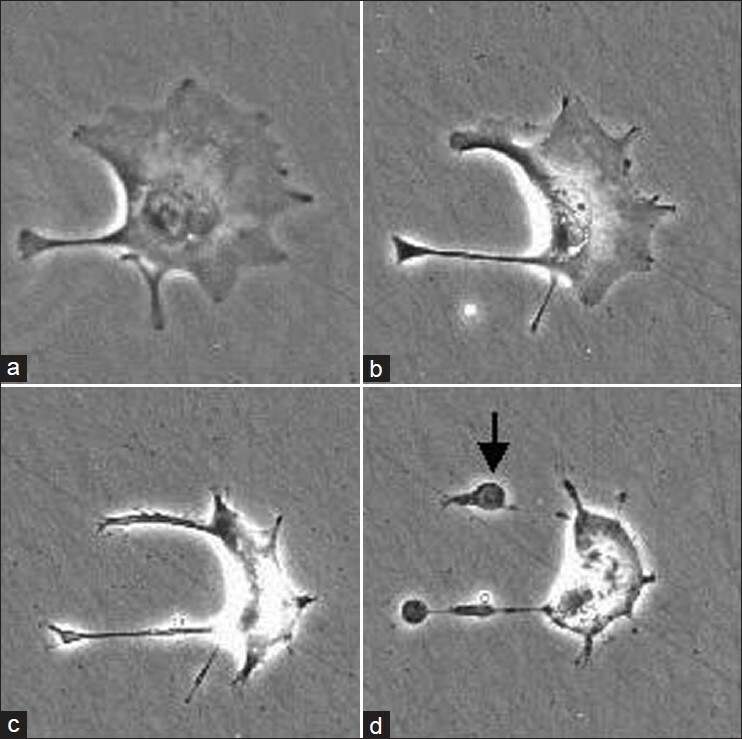 Necrotic cells display large nuclear remnants and almost invisible tails [Table 1]. Comet assay has been introduced to many different cell models as a convenient method of DNA damage and repair screening, toxicity of anti-cancer agents and apoptosis studies. These techniques are often tedious; might damage the cell membrane changing the distribution of cell population of live, apoptotic and or necrotic cells. Appears to be a choice technique for the accurate quantification of apoptosis and is a method which distinguishes apoptotic from non-apoptotic cells by means of DNA staining. It is a technique for counting, examining, and sorting microscopic particles suspended in a stream of fluid. It allows simultaneous multi parametric analysis of the physical and or chemical characteristics of single cells flowing through an optical and or electronic detection apparatus. FCM DNA analysis also allows definition of the relationship between the induction of apoptosis by different agents and their specific cell cycle phase. Easy, rapid and accurate quantitation of apoptosis in both viable and fixed single cells. Explain the relationship between induction of apoptosis by different agents and their cell cycle phase specificity. Very time consuming as it has multiple steps and is quantitative. Therefore, intact tissues usually require pre-treatment with an enzyme to release the individual cells for analysis. DNA polymerase or its Klenow fragments is used to incorporate labelled nucleotides into fragmented DNA by in situ nick translation. Quantification of apoptosis by ISEL can be done on a cell-to-cell basis with preservation of topological information. This method is particularly valuable when apoptotic cells are present in low frequencies. Therefore, is applied in the quantification of tumors, in which apoptosis is otherwise difficult to detect. TUNEL is more sensitive in comparison to in situ nick translation. , This is at least at least partially due to the ability of terminal transferase (used in TUNEL) to label both double and single-stranded DNA breaks, whereas polymerase I (of in situ nick translation) label only single-stranded breaks. Also, the kinetics of the enzymes is different; DNA polymerase-I is slower than terminal transferase in incorporating nucleotides [Table 3]. It enables in situ visualization of the process at the single cell level [Figure 5]. TUNEL staining precedes (and therefore, does not depend on) the appearance of the nucleosomal ladder in gel electrophoresis and leads to the explanation of ultra-structural aspects of the process. The reactions are based on the direct labelling of 3′ -hydroxyl termini of DNA breaks, and thus the lesions measured are identifiable at the molecular level. The DNA breaks occur very early in apoptosis, prior to changes in cell morphology the method thus detects apoptotic cells, which cannot yet be recognized based on changes in morphology. These assays can be applied therefore, to study the very early events of apoptosis. Since DNA content is measured in addition to DNA breaks, apoptosis can be related to the cell's position in the cycle present in the sample. However, the sensitivities and specificities of these techniques depend on fixative used, pre-treatment and concentration of terminal transferase enzyme. A new assay for non-radioactive in situ nick translation has been reported and employed to detect DNA strand breaks in apoptotic cells. Combining this assay with PI-stained DNA enables to use FCM to reveal the cell cycle phase specificity of DNA breaks. Immunohistochemistry (IHC) : The latest in the trend is immunohistochemcial detection of apoptotic cells using antibodies against a wide range of substrates most importantly Caspases 3, p53, Annexin V, and M30. Caspases 3: belongs to the family of cysteine proteases that cleave their target proteins at aspartic acid residues in a defined sequence, hence the name. , Caspase-3 is a critical executioner of apoptosis, as it is either partially or totally responsible for the proteolytic cleavage of many key proteins such as the nuclear enzyme poly (ADP-ribose) polymerase (PARP). Among the group of 11 caspases, caspase-3 has been recognized as a central player in mediating apoptosis and hence is studied most widely. Cleavage of caspase-3 requires aspartic acid at the P1 position; active caspase 3 then activates other caspase. Enzymatic activation of pro-caspases results in generation of neo-epitopes. Neo-epitopes are used as antigens for generating antibodies specific for immunodetection of the cleaved product without recognition of the intact substrate. Detection of active caspase 3 in situ may be a more unique, direct and sensitive indicator of apoptosis than detection of secondary process such as DNA fragmentation or cleavage of caspase substrate. Activated caspase-3 IHC is an easy, sensitive, and reliable method for detecting and quantifying apoptosis. Inhibition of caspase activities has been considered to be a novel therapeutic strategy for a variety of apoptosis- related diseases involving nervous system defects, retinal degeneration, liver injury, stunned myocardium, and sepsis, by reducing apoptosis and thereby improving organ function. Radioactive 99mTc-labeled annexin V used in vivo is tested extensively in animals. Alternative non-invasive near-infrared fluorescent imaging can detect annexin V in apoptotic cells and tumor cells affected by chemotherapy in vivo. M30 : A neoepitope in cytokeratin 18 (CK18), termed M30 neoantigen, becomes available at an early caspase cleavage event during apoptosis of epithelium-derived cells, and is not detectable in vital or necrotic epithelial cells. A monoclonal antibody, M30, specifically recognizes a fragment of CK18 cleaved at Asp396 (M30 neoantigen) ([Figure 8]). M30 antibody is specific to this CK18 cleavage site and does not react with viable or necrotic cells. 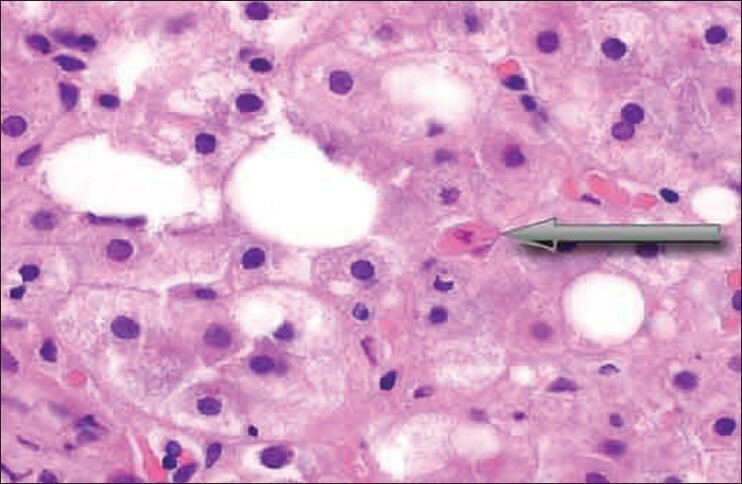 It is an early indicator of apoptosis in epithelial cells. , M30 is a marker validated both in vitro and in vivo on trophoblastic tissue in human placenta, endometrium, colon, and salivary glands. M30 remains immuno reactive in paraffin embedded tissue and is absent in non-apoptotic cells hence can be used in the study of apoptosis in clinical and experimental materials. Less prone to artifacts and not expressed in necrotic cells. There is high expression of M30 in most cancer cells, but not in non-epithelial (lymphoid) cells. This makes M30 neo-epitope a specific marker of apoptosis in only epithelial cells. 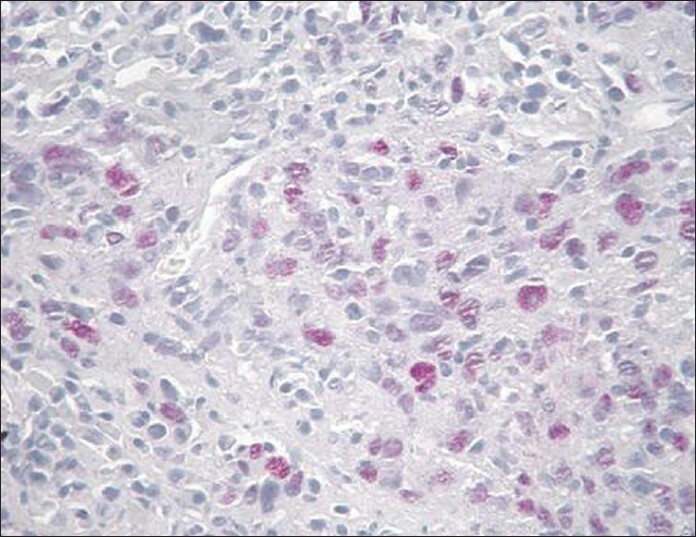 The major limitation of IHC is that, all these current methods require detaching, washing and transferring the cells. These procedures might damage the cell membranes changing the cell population distribution of live, apoptotic and/or necrotic cells. These multiple steps also consume more time and more materials allowing for loss of the cells through the procedures. Validate observations obtained with other approaches etc. In general, the light microscopy approach can provide both qualitative and quantitative data, TEM analysis is essentially qualitative, and SEM studies can provide information of the cell surface, cell-cell and cell-substrates interactions. The cytochemical and immunocytochemical techniques allow investigating morpho-functional correlates of the various apoptotic pathways. Double staining procedures can be often used to correlate both apoptotic cells to their phenotype. Moreover, in situ immunocytochemical techniques are useful to investigate the distribution of the various cell proteins both at the single cell level and at the cell-to-cell contact sites. Accurate detection of apoptosis in various stages help in assessing apoptotic index, which is known to be an indicator of prognosis and metastasis thereby predicts outcome of the treatment. 1. Gluecksmann A. Cell death in normal vertebrate ontogeny. Biol Rev 1951;26:59-86. 2. Lockshin RA, Zakeri Z. Programmed cell death and apoptosis: Origins of the theory. Nat Rev Mol Cell Biol 2001;2:545-50. 3. Kerr JF, Wyllie AH, Currie AR. Apoptosis: A basic biological phenomenon with wide-ranging implications in tissue kinetics. Br J Cancer 1972;26:239-57. 4. Fadeel B, Gleiss B, Hogstrand K, Chandra J, Wiedmer T, Sims PJ, et al. Phosphatidylserine exposure during apoptosis is a cell-type specific event and does not correlate with plasma membrane phospholipid scramblase expression. Biochem Biophys Res Commun 1999;266:504-611. 5. Vaux DL, Cory S, Adams JM. Bcl-2 gene promotes haemopoietic cell survival and co-operates with c-myc to immortalize pre-B cells. Nature 1988;335:440-2. 6. Ellis HM, Horvitz HR. Genetic control of programmed cell death in the nematode C. elegans. Cell 1988;44:817-29. 7. Elmore S. Apoptosis: A review of programmed cell death. Toxicol Pathol 2007;35:495-516. 8. Ziegler U, Groscurth P. Morphological features of cell death. News Physiol Sci 2004;19:124-8. 9. Majno G, Joris I. Apoptosis, oncosis, and necrosis. An overview of cell death. Am J Pathol 1995;146:3-15. 10. Johnson VL, Ko SC, Holmstrom TH, Eriksson JE, Chow SC. Effector caspases are dispensable for the early nuclear morphological changes during chemical-induced apoptosis. J Cell Sci 2000;113:2941-53. 11. Kerr JF, Winterford CM, Harmon BV. Apoptosis: Its significance in cancer and cancer therapy. Cancer 1994;73:2013-026. 12. Cummings MC, Winterford CM, Walker NI. Apoptosis. Am J Surg Pathol 1997;21:88-101. 13. oini Y, Paakko P, Lehto VP. Histopathological evaluation of apoptosis in cancer. Am J Pathol 1998;153:1041-53. 14. Kurosaka K, Takahashi M, Watanabe N, Kobayashi Y. Silent cleanup of very early apoptotic cells by macrophages. J Immunol 2003;171:4672-9. 15. Louagie H, Cornelissen M, Philippe J, Vral A, Thierens H, De Ridder L. Flow cytometric scoring of apoptosis compared to electron microscopy in gamma irradiated lymphocytes. Cell Biol Int 1998;22:277-83. 16. Sarraf CE, Ansari TW, Conway P, Notay M, Hill S, Alison MR. Bromodeoxyuridine-labelled apoptosis after treatment with antimetabolites in two murine tumours and in small intestinal crypts. Br J Cancer 1993;68:678-80. 17. Shiraishi H, Okamoto H, Yoshimura A, Yoshida H. ER stress-induced apoptosis and caspase-12 activation occurs downstream of mitochondrial apoptosis involving Apaf-1. J Cell Sci 2006;119:3958- 66. 18. Stacey NH, Bishop CJ, Halliday JW, Halliday WJ, Cooksley WG, Powell LW, et al. Apoptosis as the mode of cell death in antibody-dependent lymphocytotoxicity. J Cell Sci 1985;74:169-79. 19. Krysko DV, Denecker G, Festjens N, Gabriels S, Parthoens E, Herde KD, et al. Macrophages use different internalization mechanisms to clear apoptotic and necrotic cells. Cell Death Differ 2006;13:2011-22. 20. Bicknell GR, Snowden RT, Cohen GM. Formation of high molecular mass DNA fragments is a marker of apoptosis in the human leukemic cell line, U937. J Cell Sci 1994;107:2483-9. 21. Higuchi Y. Glutathione depletion-induced chromosomal DNA fragmentation associated with apoptosis and necrosis. J Cell Mol Med 2004;8:455-64. 22. Narendra P. Singh. A simple method for accurate estimation of apoptotic cells. Exp Cell Res 2000;256:328-37. 23. Oberhammer F, Wilson JW, Dive C, Morris ID, Hickman JA, Wakeling AE, et al. Apoptotic death in epithelial cells: Cleavage of DNA to 300 and/or 50 kb fragments prior to or in the absence of internucleosomal fragmentation. EMBO J 1993;12:3679-84. 24. Page MT, Quintana PJ, Ligutti JA, Sabbadini RA. Cell death in cultured adult rat Cardiomyocytes: Use of the comet assay to distinguish apoptosis from necrosis. Basic and Appl. Myology Basic and applied Myology 2000;10:159-70. 25. Collins AR. Comet assay-principles, applications, and limitations. Methods Mol Biol 2002;203:163-77. 26. Olive PL, Frazer G, Banath JP. 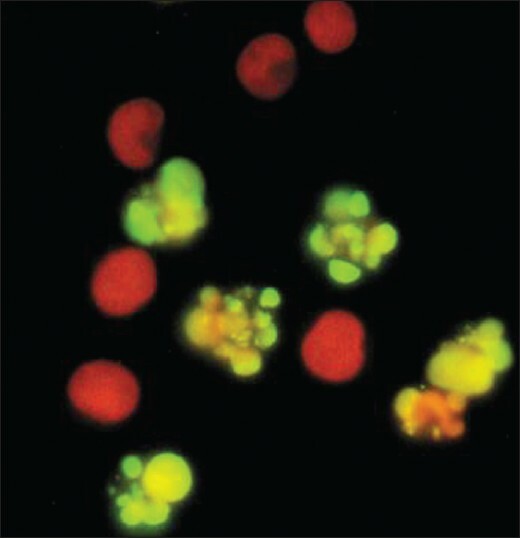 Radiation-induced apoptosis measured in TK6 human B lymphoblast cells using the comet assay. Radiat Res 1993;136:130-6. 27. McNair FL, Marples B, West CML, Moore JV. A comet assay of DNA damage and repair in K562 cells after photodynamic therapy using haematoporphyrin derivative, methylene blue and meso-tetrahydroxyphenylchlorin. Br J Cancer 1997;75:1721-9. 28. Yasuhara S, Zhu Y, Matsui T, Tipirneni N, Yasuhara Y, Kaneki M, et al. Comparison of comet assay, electron microscopy, and flow cytometry for detection of apoptosis. J Histochem Cytochem 2003;51:873-85. 29. Zamai L, Falcieri F, Zauli G, Cataldi A, Vitale M. Optimal detection of apoptosis by flow cytometry depends on cell morphology. Cytometry 1993;14:891-7. 30. Nicoletti I, Migliorati G, Pagliacci MC, Grignani F, Riccardi C. A rapid and simple method for measuring thymocyte apoptosis by propidium iodide staining and flow cytometry. J Immunol Methods 1991;139:271-9. 31. Telford WG, King LE, Fraker PJ. Comparative evaluation of several DNA binding dyes in the detection of apoptosis associated chromatin degradation by flow cytometry. Cytometry 1992;13:137-43. 32. Ferlini C, Di Cesare S, Rainaldi G, Malorni W, Samoggia P, Biselli R, et al. Flow cytometric analysis of the early phases of apoptosis by cellular and nuclear technique. Cytometry 1996;24:106-15. 33. Bertho Al, Santiago MA, Coutinho SG. Flow cytometry in the study of cell death. Mem Inst Oswaldo Cruz 2000;95:429-33. ISSN 0074-0276. 34. Gavrieli Y, Sherman Y, Ben-Sasson SA. Identification of programmed cell death in situ via specific labeling of nuclear DNA fragmentation. J Cell Biol 1992;119:493-50. 35. Wijsman JH, Jonker RR, Keijzer R, van de Velde CJ, Cornelisse CJ, van Dierendonck JH. A new method to detect apoptosis in paraffin sections: In situ end-labeling of fragmented DNA. J Histochem Cytochem 1993;41:7-12. 36. Ansari B, Coates PJ, Greenstein BD, Hall PA. In situ end-labelling detects DNA strand breaks in apoptosis, and other physiological, and pathological states. J Pathol 1993;170:1-8. 37. Negoescu A, Lorimier P, Labat-Moleur F, Drouet C, Robert C, Guillermet C, et al. In situ apoptotic cell labeling by the TUNEL method: Improvement and evaluation on cell preparations. J Histochem Cytochem 1996;44:959-68. 38. Gorczyca W, Gong J, Darzynkiewicz Z. Detection of DNA strand breaks in individual apoptotic cells by the in situ terminal deoxynucleotidyl transferase and nick translation assays. Cancer Res 1993;53:1945-51. 39. Mundle SD, Gao XZ, Khan S, Gregory SA, Preisler HD, Raza A. Two in situ labeling techniques reveal different patterns of DNA fragmentation during spontaneous apoptosis in vivo, and induced apoptosis in vitro. Anticancer Res 1995;15:1895-904. 40. Fan TJ, Han LH, Cong RS, Liang J. Caspase family proteases and apoptosis. Acta Biochim Biophys Sin (Shanghai) 2005;37:719-27. ISSN 1672-9145. 41. Sun XM, MacFarlane M, Zhuang J, Wolf BB, Green DR, Cohen GM. Distinct caspase cascades are initiated in receptor-mediated and chemical-induced apoptosis. J Biol Chem 1999;274:5053-60. 42. Logue SE, Martin SJ. Caspase activation cascades in apoptosis. Biochem Soc Trans 2008;36:1-9. 43. Porter AG, JaeNicke RU. Emerging roles of caspase-3 in apoptosis. Cell Death Differ 1999;6:99-104. 44. Duan WR, Garner DS, Williams SD, Funckes-Shippy CL, Spath IS, Blomme EA. Comparison of immunohistochemistry for activated caspase-3 and cleaved cytokeratin 18 with the TUNEL method for quantification of apoptosis in histological sections of PC-3 subcutaneous xenografts. J Pathol 2003;119:221-8. 45. Haupt S, Berger M, Goldberg Z, Haupt Y. Apoptosis - the p53 network. J Cell Sci 2003;116:4077-85. 46. Vousden KH, Xin Lu. Live or let die. The cell's response to p53. Nat Rev Cancer 2002;2:594-604. 47. Fridman JS, Lowe SW. Control of apoptosis by p53. Oncogene 2003;22:9030-40. 48. Walaszek Z, Hanausek M. Molecular marker of apoptosis as prognostic indicators in cancer. J Cell Biol Mol Lett 2000;5:278-9. 49. Guan YS, He Q, La Z. Roles of p53 in carcinogenesis, diagnosis and treatment of hepatocellular carcinoma. J Cancer Mol 2006;2:191-7. 50. Ravanat C, Archipoff G, Beretz A, Freund G, Cazenave JP, Freyssinet JM. Use of annexin-V to demonstrate the role of phosphatidylserine exposure in the maintenance of haemostatic balance by endothelial cells. Biochem J 1992;282:7-13. 51. Verhoven B, Krahling S, Schlegel RA, Williamson P. Regulation of phosphatidylserine exposure and phagocytosis of apoptotic Tlymphocytes. Cell Death Differ 1999;6:262-70. 52. Vermes I, Haanen C, Steffens-Nakken H, Reutelingsperger C. A novel assay for apoptosis: Flow cytometric detection of phosphatidylserine expression on early apoptotic cells using fluorescein labelled Annexin V. J Immunol Methods 1995;184:39-52. 53. Heerde WL, Robert-Offerman S, Dumont E, Hofstra L, Doevendans PA, Smits JF, et al. Markers of apoptosis in cardiovascular tissues: Focus on Annexin V. Cardiovasc Res 2000;45:549-59. 54. Petrovsky A, Schellenberger E, Josephson L, Weissleder R, Bogdanov A Jr. Near-infrared fluorescent imaging of tumor apoptosis. Cancer Res 2003;63:1936-42. 55. Roth GA, Krenn C, Brunner M, Moser B, Ploder M, Spittler A, et al. Elevated serum levels of epithelial cell apoptosis-specific cytokeratin 18 neoepitope M30 in critically ill patients. Shock 2004;22:218-20. 56. Morsi HM, Leers MP, Jager W, Bjorklund V, Radespiel-Troger M, Kabarity H, et al. 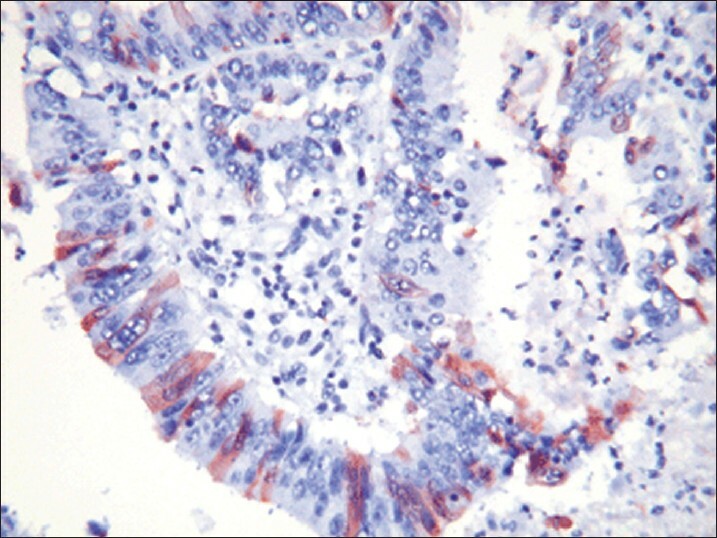 The patterns of expression of an apoptosis-related CK18 neoepitope, the bcl-2 proto-oncogene, and the Ki67 proliferation marker in normal, hyperplastic, and malignant endometrium. Int J Gynecol Pathol. 2000;19:118-26. 57. Leers MP, Kolgen W, Bjorklund V, Bergman T, Tribbick G, Persson B, et al. Immunocytochemical detection and mapping of a cytokeratin 18 neo-epitope exposed during early apoptosis: J Pathol 1999;187:567-72. 58. Grassi A, Susca M, Ferri S, Gabusi E, D'Errico A, Farina G, et al. Detection of the M30 Neoepitope as a new tool to quantify liver apoptosis: Timing and patterns of positivity on frozen and Paraffin-embedded sections. Am J Clin Pathol 2004;121:211-9. 59. Kadyrov M, Kaufmann P, Huppertz B. Expression of a Cytokeratin 18 Neo-epitope is a specific marker for trophoblast apoptosis in human placenta. Placenta 2001;22:44-8. 60. Shinohara T, Ohshima K, Murayama H, Kikuchi M, Yamashita Y, Shirakusa T. Apoptosis and proliferation in gastric carcinoma: The association with histological type. Histopathology 1996;29:123-9. 62. Burcombe R, Wilson GD, Dowsett M, Khan I, Richman PI, Daley F, et al. Evaluation of Ki-67 proliferation and apoptotic index before, during and after neo adjuvant chemotherapy for primary breast cancer. Breast Cancer Res 2006;8:1-10. 63. Tanaka F, Kawano Y, Li M, Takata T, Miyahara R, Yanagihara K, et al. Prognostic significance of apoptotic index in completely resected non-small-cell lung cancer. J Clin Oncol 1999;17:2728-36. 64. Naresh KN, Lakshminarayanan K, Pai SA, Borges AM. Apoptosis index is a predictor of metastatic phenotype in patients with early stage squamous carcinoma of the tongue. Cancer 2001;91:578- 84.